Devon-Aire's Camden Tall Boot is made with European Calfskin leather that is soft enough to mold to your leg for a custom look with the stylish elongated Spanish top and contoured ankle design. Devon-Aire's exclusive UGS outsole technology is made with a special polymer and provides shock absorption while also resisting damage from acidic and wet barn conditions. The Camden boots feature a Grippa sole to keep you securely in the stirrup along with a carbon steel shank for support and stability. 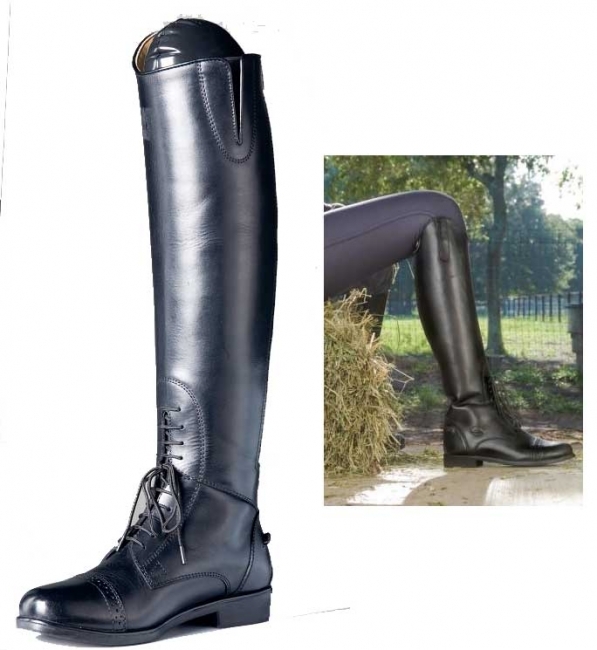 Take your Camden Tall Boots on and off easily with the heavy duty, self sealing YKK zipper that features a slider lock and snap top closure to keep it from moving down while you ride. Woven heavy duty elastic at the back also helps to eliminate stress on the zipper. Additional details of these quality field boots include traditional punched toe cap, spur rest, and 9 paired eyelets with notched flex. Made to last, they feature heavy duty stitching and reinforcement. Heavy duty self sealing YKK zipper with slider lock. Small stretch elastic gusset at the top of the cuff for ideal fit.
. Ladies Sizes . . Calf (foot) . . Inside Top . . Inside Calf . . . . Height . Note: Due to nature of the woven elastic, and seam allowance on dies measurements are +/- 1/4".